According to the Oxford Concise Medical Dictionary, a pneumothorax can be defined as "Air in the pleural cavity". This occurs when there is a breach of the lung surface or chest wall which allows air to enter the pleural cavity and consequently cause the lung to collapse. Various causes of a pneumothorax exist and each pneumothorax is classified according to its cause. Primary pneumothorax: also referred to as a spontaneous pneumothorax or primary spontaneous pneumothorax, It is characterised by having no clear cause or no known underlying lung pathology. There may be contributing factors, such as cigarette smoke, family history, the rupture of bulla (small air filled sacs in the lung tissue) but these will not cause pneumothorax itself. Secondary pneumothorax: also referred to as a non-spontaneous or complicated pneumothorax. It occurs as a result of an underlying lung pathology such as COPD, Asthma, Tuberculosis, Cystic Fibrosis or Whooping Cough. A pneumothorax can further be classified as a tension or non-tension pneumothorax. A tension pneumothorax is caused by excessive pressure build up around the lung due to a breach in the lung surface which will admits air into the pleural cavity during inspiration but will not allow any air to escape during expiration. The breach acts as a one-way valve. This leads to lung collapse. The removal of the air is through surgical incision by inserting a under water drain in the pleural cavity. This excessive pressure can also prevent the heart from pumping effectively which may lead to shock. A non-tension pneumothorax is not considered as severe as there is no ongoing accumulation of air and therefore there is no increasing pressure on the organs and the chest. Other causes of a pneumothorax can be trauma or incorrect medical care.A traumatic pneumothorax is caused by trauma to the lungs. Some of the causes are the following: Stabwound, gunshot or injury from a motor vechicle accident or any other traume to the lungs. A pneumothorax which develops as a result of a medical procedure or incorrect medical care i.e. accidental puncture to the lung during surgery, is termed as an iatrogenic pneumothorax. Primary spontaneous pneumothorax occurs most often in people between age 18 - 40 and Secondary spontaneous pneumothoraces occur more frequently after age 60 years.Prevalence of a pneumothorax in a newborn is a potentially serious problem and it occurs in about 1-2% of all births. According to Chang and Mukherji (2007) the incidence of primary spontaneous pneumothorax in the USA (age-adjusted) is 7.4-18 cases per 100,000 persons per year for men and 1.2-6 cases per 100,000 persons per year for women. Incidence of secondary spontaneous pneumothorax (age-adjusted) is 6.3 cases per 100,000 persons per year for men and 2 cases per 100,000 persons per year for women. Chronic obstructive pulmonary disease (COPD) is a common cause of secondary spontaneous pneumothorax that carries an incidence of 26 cases per 100,000 persons. The incidence of iatrogenic pneumothorax is not known, but it probably occurs more often than primary and secondary spontaneous pneumothoraces combined.Incidence is higher in men than in women, at a ratio of 6.2:1 for primary pneumothorax and 3.2:1 for secondary pneumothorax. Although some view primary spontaneous pneumothorax as more of a nuisance than a major health threat, deaths have been reported. Secondary spontaneous pneumothorax can be life threatening, depending on the severity of the underlying disease and the size of the pneumothorax. Mortality percentages in patients with COPD and spontaneous pneumothorax vary from 1-17%. Iatrogenic pneumothorax may cause substantial morbidity and, rarely, death (Chang & Mukerji, 2007). The lungs are located inside the chest cavity and air is drawn into the lungs by the diaphragm. The pleural cavity is the region between the chest wall and the lungs. 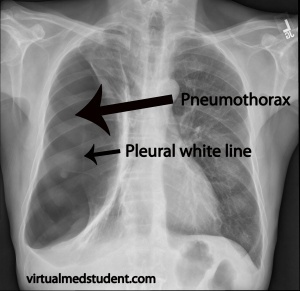 If the air enters the pleural cavity, either from the outside (open pneumothorax) or from the lung (closed pneumothorax), the lung collapses and it becomes impossible for the person to breath, even if they have an open airway. If a piece of tissue forms a one way valve which allows air to enter the pleural cavity, but not to escape, overpressure can build up with each breath (tension pneumothorax). This leads to severe shortness of breath and circulatory collapse. Air leaks from the lungs into other parts of the chest cavity can occur in newborns. Babies are normally born with collapsed lungs, and a large amount of pressure is generated as the newborn's body works to inflate their lungs with the first few breaths. For 98% of newborns there is no problem at all, but for some (2%)the lungs do not immediately open completely and the strong pressures generated to inflate the lung may cause small ruptures in the alveoli. The leaked air can be removed by the physician, and continual removal of this leaked air is required until the ruptures have healed. There is a loss of intrapleural negative pressure that can result in a lung collapse. Due to this there is a decrease in vital capacity as well as a decrease in PaO2 which is the main consequence of a pneumothorax. The decrease in PaO2 results from various factors i.e low ventilation-perfusion ratios, anatomic shunts and alveolar hypoventilation. Most patients that suffer from a pneumothorax also have an increase in alveolar-arterial oxygen tension. Initially a complete medical and physical examination needs to be conducted. On examination of the chest with a stethoscope it will be noted that there is either decreased or absent breath sounds over the area of the affected lung, which may indicate that the lung is not unfolded in the pleural cavity. There is hyperresonance (higher pitched sounds than normal) with percussion of the chest wall which is suggestive of pneumothorax diagnosis. Chest x- rays will then be used to confirm the diagnosis of the pneumothorax. In a supine chest x-ray, a deep sulcus sign is diagnostic and this is characterised by a low lateral costophrenic angle on the affected side. Also the presence of air outside normal lung airways and movement or shifting of the organs away from the air leak in the thoracic cavity will be indicative of the presence of a pneumothorax. Diagram showing a neonate with a right tension pneumothorax. Note the tracheal deviation to the left. Another procedure used is Transillumination. This is a procedure used in an emergency situation and makes use of a fiberoptic light probe that is placed on the baby's chest wall i.e. the side with the air leak will transmit a brighter light. Up to 50% of patients who suffer from a pneumothorax will have another or a recurring pneumothorax. However, there are no long-term complications after successful treatment. The main aim is to relieve the pressure on the lung and allow it to expand. It is of vital importance to try and prevent the recurrence of a pneumothorax. Treatment is determined by the severity of symptoms and indicators of acute illness, the presence of underlying lung disease, the estimated size of the pneumothorax on X-ray, and – in some instances – on the personal preference of the person involved. There are a variety of treatment options for a spontaneous pneumothorax including simple observation, chest tube placement, chemical pleurodesis through a chest tube, and surgery. Conservative management with observation until air is naturally resorbed by the body or simple chest tube placement alone has a very high rate of recurrence (about 65%) in patients with LAM. Because of this, most thoracic surgeons recommend pleurodesis (a procedure which obliterates the pleural space to prevent future pneumothoraces) after the first episode of pneumothorax. Pleurodesis can be done mechanically (using physical abrasion) or chemically (using talc, doxycycline, bleomycin or other agents). While chemical pleurodesis through a chest tube can be successful, this may result in incomplete pleurodesis due to uneven distribution of the chemical. Surgical treatment, using video-assisted thoracoscopy (VATS), is the preferred approach. For patients with recurrent pneumothorax after surgical intervention, there are several options. For patients with a total or near total collapse, repeat surgical intervention is recommended. Options include a repeat mechanical pleurodesis if it is unclear whether an appropriate mechanical pleurodesis was done initially or pleurectomy in which the pleura overlying the ribs is actually removed. Another option to consider for refractory pneumothorax is chemical pleurodesis in which a drug or other agent is used to create an inflammatory response that results in pleurodesis. Talc is the most commonly used agent due to its effectiveness. Historically, talc pleurodesis was considered a contraindication to future lung transplantation because of the intense inflammatory response that made surgery very difficult. However, in the 2014 consensus document for the selection of patients for lung transplant by the International Society for Heart and Lung Transplantation, pleurodesis was not considered a contraindication for transplantation. They recommended that “pneumothorax in a patient who may become a future transplant recipient should be given the best immediate management… and “the choice of intervention is unlikely to affect future acceptance for transplantation.” Patients who undergo lung transplantation after a pleural intervention are at higher risk of bleeding complications; therefore, a strategy of optimizing successful treatment of pneumothorax while minimizing the impact on potential future lung transplantation should be undertaken. Given the potential that any intervention could have an impact on future lung transplantation should this become necessary, it is critical that the patient, pulmonologist and surgeon work together to develop the best treatment plan for each individual patient. ↑ Almoosa KF, Ryu JH, Mendez J, Huggins JT, Young LR, Sullivan EJ, Maurer J, McCormack FX, Sahn SA. Management of pneumothorax in lymphangioleiomyomatosis. Effects on recurrence and lung transplantation complications. Chest 2006; 129: 1274-1281.